32 When Mary reached the place where Jesus was and saw him, she fell at his feet and said, “Lord, if you had been here, my brother would not have died.” 33 When Jesus saw her weeping, and the Jews who had come along with her also weeping, he was deeply moved in spirit and troubled. 34 “Where have you laid him?” he asked. “Come and see, Lord,” they replied. 35 Jesus wept. The death and resurrection of Lazarus is a very common story. You may, in fact, be wondering where the rest of the story is! Sometimes when we read the Bible we naturally look to the end of the story for the meaning. This is not uncommon in our daily lives and struggles. We want to know the ending. It feels as if we NEED to know the ending. What will he or she say when she finds out? How will I get along without this or that? Who will I spend time with when so-and-so is gone? We all have questions that we want to know the answers to. The truth is, though, we will never know the answers to these questions soon enough. There will always be times that we hurt and yearn for an answer we cannot obtain. Jesus here understands this truth. Verse 35 says, “Jesus wept.” In the midst of losing someone he cared about Jesus, the God of all creation, took time to weep. Christ here is telling us that it is okay to weep. It is okay to lament about our daily lives. It is normal for us to wonder what will happen and to be scared. 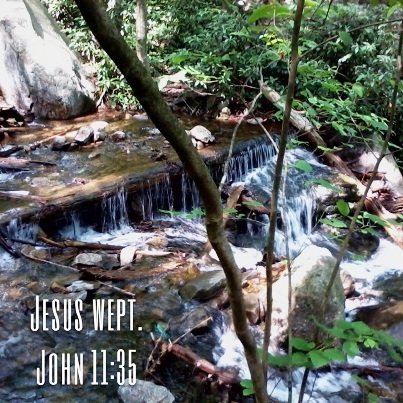 Jesus tells us here to weep, to lament, and to take time to reflect on the things happening in our lives. Take time today to orient yourself with your own life. Don’t rush to work or school. Take time to weep for your pain. God cares, and he wants you to care about your own life as strongly as He does for your life. God, help me today to remember my life. Help me to know your presence and be okay with pain, failure, and sufferings. AMEN.